Marilyn featured in Rental homes in Whistler! So excited to have my work in 4 rental units in Whistler, Canada. Please contact for more info! Art of Art: Westcoast Formal Charity event! My first time having my paintings in a nightclub on Granville Street Downtown Vancouver! Very exciting to walk in and see my work on the walls! This year I did a series of naked ladies. I wanted to create a reaction from the crowd. I usually use lots of color in my paintings but this year I decided to change it up and only use black and white. I also decided to use charcoal and used my finger to smudge to round the edges. This series more personal and it was a way for me to express my mental state of overcoming a personal trauma. I wanted to show some vulnerability by involving women's skin. Women are taken advantage of everyday and its hard for women to protect themself. Society judges women very harshly for their bodies, social media escpecially. Making women feel as though their bodies are not good enough and to try products that will make them "feel better about themselves". The women I chose were also very important people to me as they played a big part in the healing of my trauma. They helped me to understand confidence, happiness and self-worth. I took photos of my friends and myself to show that all bodies are beautiful, at whatever angle, it is okay to show some skin. Women create and nurture babies, the body should be seen as a temple. Some people get offended by naked women, but they shouldnt be.Women make the earth go round, they give life! Yet, women are still being taken advantage of, put down and not given the credit they deserve. However, my pieces are not fully naked, and some pieces express the individual by showing yoga, meditation and peacefulness. I had a wonderful year at Art! 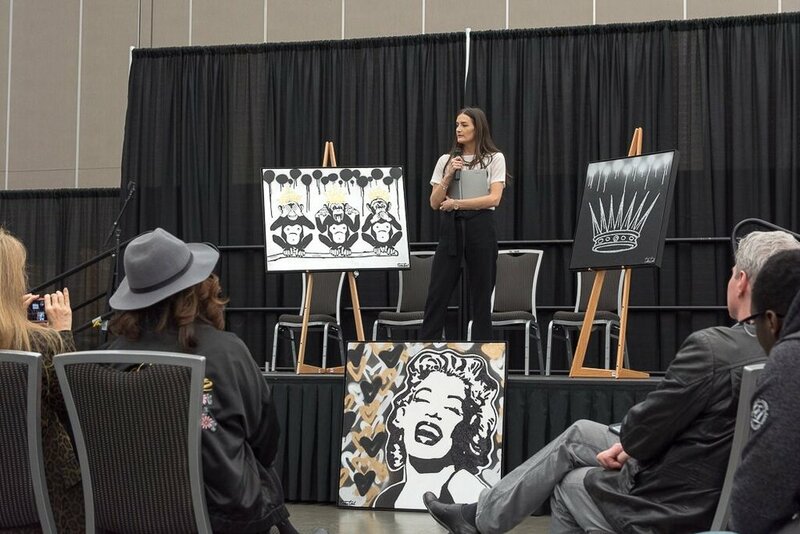 Vancouver and ended it by selling the middle piece titled, "Empowered women empower women" to a wonderful lady! This piece was made for Canada's 150th Birthday this year. I incorporated my style of the bleeding hearts, which is done with spray paint. I then added a white Maple leaf on top, using my own technique and wiped out the thick line and showing the outline of the famous maple leaf. "The art project - Bad Bags/Good Bags“ by German artist Reinhard Wanzke is about travelling and connecting artists all around the world. Wanzke is carrying seven „Ferragamo“ handbags with him, which are central to the art project. Starting his tour in Frankfurt (Germany) he meanwhile visited Kampala (Uganda), Sydney (Australia), Kuching (Malaysia), Changzhou (China) and now Vancouver. His last but one stop will be New York before he returns end of June to Germany. There will be the final exhibition with then 49 artworks from all around his world trip and the seven bags empty. Why empty? The modus operandi always has been the same during his travel: he invites artists to contribute one work of art to one of the bags, and during the first, the local exhibition the art work will remain invisible to the audience. So e.g. the Vancouver art works will be on display for the first time at the New York exhibition and then in Kassel (Germany), when there is documenta14. 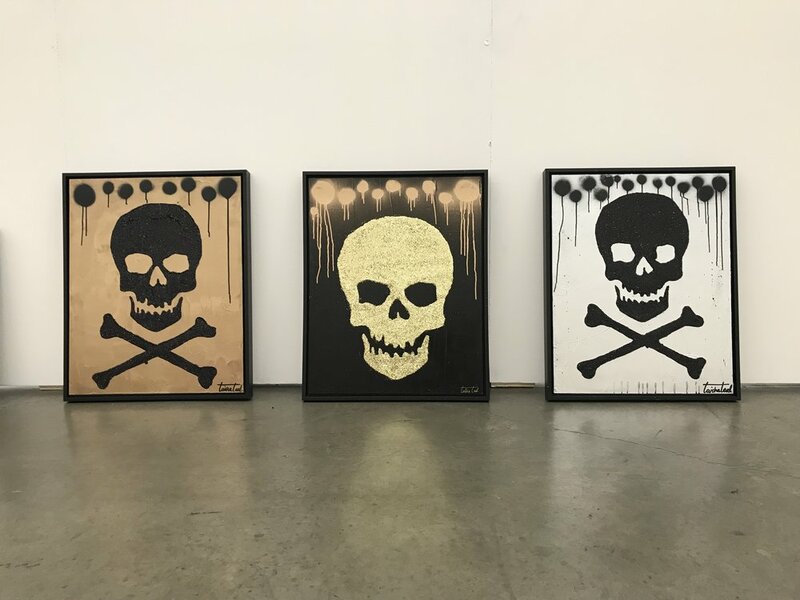 The collection now will be extended by art works from Vancouver based artists Taisha Teal, Skyla Wayrynen, Irene Hyojeong Hwang, Hank Bull among others." I am lucky to be in another art fair with my mother and sister outside the Vancouver Convention Center! I am excited to announce I am in another Show with many more amazing artists! Lipstick that loves you back! This piece is done by hand with Burts Bees lip stick, lip chap, lip liner and lip shimmer. Experience SHADES by Burt’s Bees Lipstick! Please help support this cause by spreading word to those in Toronto, and if you are in the area, please visit the Arta Gallery in Toronto’s Distillery District between Feb 27 & Mar 11, 3 – 8pm. Enjoy a FREE Admission & FREE Gift daily! 10 Artists. 14 Shades of Lipstick. Endless creativity. Extremely happy to announce my Marlyn Monroe painting was featured on Art! Vancouver's magazine and sold at Art fair last May 2015.